At least 18 Libyan National Army (LNA) soldiers were killed today as the fight to conclude the Battle of Benghazi went into its third day. 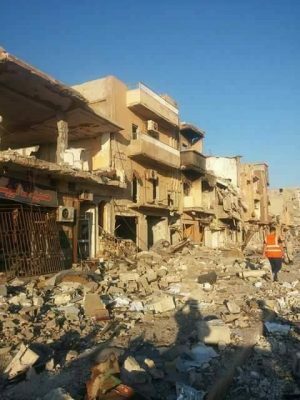 It was the heaviest confirmed LNA death toll within a twenty-four hour period for some weeks. Saiqa Special Forces published a list of the names of the dead, but it is unclear if this included the shooting of a part-time member of the LNA in an area which is now supposed to have been cleared of militants. Abdullah Al-Arabi, a 23 year-old player with the Al-Nasr football club, was shot by a sniper in Suq Al-Hout. It is not known if the gunman was apprehended. A similar sniper attack from an area supposedly under LNA control happened last April on the Guiliana Bridge, when a pregnant woman travelling in a car was shot and killed along with the sailor who went to her aid. The mopping-up operation in Sidi Akribesh is clearly taking longer and proving more costly than LNA commanders expected. Cornered militants appear to be fighting ferociously. It is understood that a woman given safe passage out of the fighting shot and wounded two soldiers who were welcoming her. She was in turn shot and taken to hospital. Two other militants were reportedly captured trying to escape. The LNA is claiming that during their advance they killed another leader of the terrorist group Ansar Al-Sharia, Nasser Al-Tarshani, also known as Abu Khaled Al-Madani, who came from Sebha. Troops found ten rotting bodies in a school in Sabri, which have not yet been identified. Also today two young men died and a third lost a leg in a boobytrap blast when apparently entering their Sabri home. However, another Sabri resident returned to his property to find his dusty car still decorated for the wedding three years ago that was due to be held on the very day the militants moved in. The unnamed individual and his family fled but he was later married elsewhere in the city. 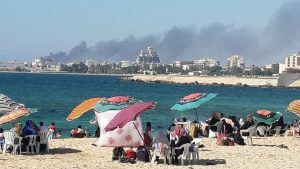 Benghazinos took to the beaches today in a festive mood but five kilometres away they could hear the sound of artillery fire and see plumes of black smoke rising from the last corner of the battle.